Barricade Lights and Beacons - Click the picture below a larger version. - AC4D combines an LED light source and 3-volt photocell technology with the popular "D" cell battery (not included). - Extra light intensity is achieved via a computer designed, high clarity, polycarbonate lens. - Features a light sensing photo cell to turn light on and off. - Amber and new red lenses (RSCD) models available. - Three modes are available - flash, steady, and off. - Changing from a flashing type "A" to a steady burn type "C" and back is simple with push on the mode switch. - Meets the May 2001 ITE purchase specification. 10 - 3-1/2" bolts, 2 - on/off keys, and 1 wrench. -Fact sheet and instruction sheet available. - For MAC4D mono-directional version - click here. AC4D-RL Yellow Red - New!! AC4DSL-NL - SOLAR D-Cell LED NEW! - Will operate on 2 or 4 D-cell batteries, solar charging cells, or a combination of both. - Equipped with a photocell which turns light on and off at dawn and dusk. - Tested by a Coast Guard approved laboratory. - Much more here: Fact and - Instruction Sheet. - Incandescent bulb powered by a six volt battery (not incl.). - Offered in a flashing type "A" model, steady burn type "C", or in a combination "A" and "C" version. - Finger loop on the circuit makes removing circuits case easy. - Available with amber or red lens. - 10 - 3-3/4" bolts, 2 - on/off keys, and 1 wrench are included with each box of 10 lights. - Fact sheet. Click model numbers below for instruction sheets. - The TLL8S TrafiLITE combines all of the features of the TLW8S above with an LED light source. - Three modes: flashing, steady burn, and off. - Photo cell turns light on and off automatically. - Requires one or two six volt lantern batteries (not incl.). - Exceeds I.T.E. and MUTCD standards. - Independent laborotory tested to I.T.E. Type B requirements. - Visor eliminates sun glare. - Light dims 50% at night - extends battery life. - Available with amber lens. - Operates on two or four alkaline "D" cell batteries (not incl.). - Lenses molded from UV stabilized polycarbonate. - Case is high impact polypropylene. Fact sheet. 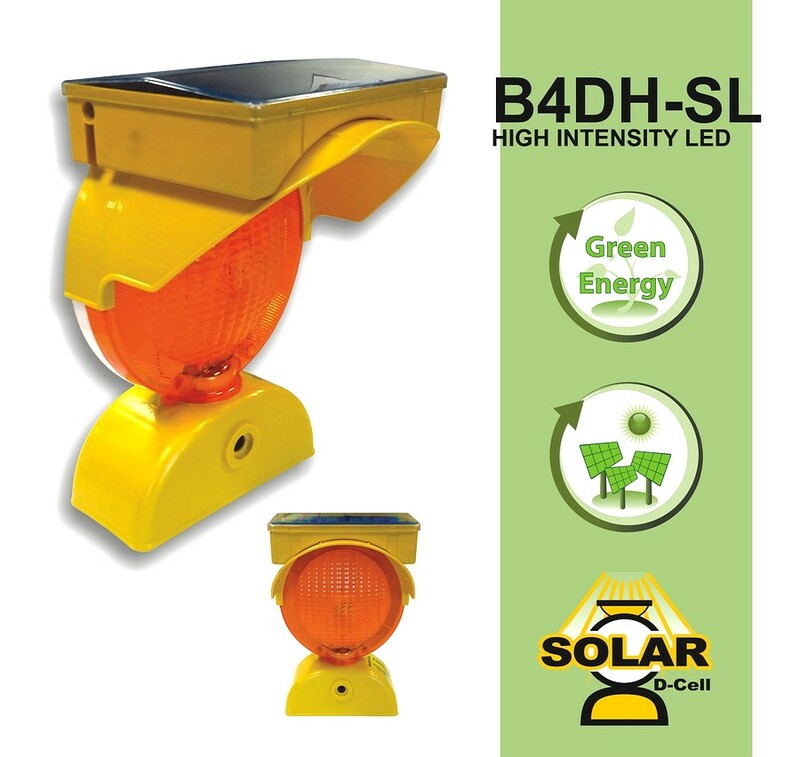 B4DH-SL - Solar High Intensity D-Cell NEW! - Exceeds ITE standards and MUTCD visibility specifications. - Independent laboratory tested to I.T.E. Type B requirements. - Solar powered - 5 year maintenance free operational life. - Select from 3 modes: Flashing/Dim, Flashing/No Dim, or Off. - Dim mode dims light to 50% at night to extend battery life. - Unidirectional lens with attached visor to eliminate sun glare. - Features optically correct UV stabilized polycarbonate lens, high impact visor and case, and stainless steel contacts. - May be self-certified for compliance with NCHRP-350 crash test standards. - Each light supplied with mounting hardware: bolts, switch pins, and wrench. Bolt protectors available at extra cost. - Operates with solar cells independently or in combination with "D" cell batteries (not included). - Fact sheet. - Sequential devices now referenced in the new 2009 MUTCD - Sect. 6F.63. - Separates motorist from work areas and drop-offs. - Sequential channelizing devices provide for smooth and gradual traffic movement from one lane to another. - Steady-burns in low intensity mode and pulses momentarily to higher intensity keeping motorists in their proper path and protecting workers (see video). - Carrying handle on each light comes standard. - Standard package: 10 devices per carton. - Operates on one or two 6 volt batteries (not included). - Includes charging base with 12V plug adapter - simply drop lights into base to recharge. Stores easily in trunk. - Package: 5 devices with charging tray. Fact sheet. - UniLamp™ features a 360°, computer designed high clarity polycarbonate lens. - Two versions: flashing and flashing with photocell. - The yellow case is made of high impact polyethelene. - Integrated cone mounting bracket. - Powered by a 6 volt battery (not included). - Available with amber or red lens. Fact sheet. - All beacons feature a 360°, computer designed high clarity polycarbonate lens. Fact sheet. - Wind tunnel tested for security of attachment at speeds of up to 160 mph. - Two lamp choices: Xenon double flash or rotating Halogen. - Rotating beacons run directly from the drive motor for quiet and effecient operation. - Mounting choices: Magnetic or permanent. - Power supply choices: Plug adapter or permanently wired. - Allows standard barricade lights to be mounted to cones. - Bolt the light to the bracket and drop over the cone. - The Cone Light couples a mono-directional, computer designed polycarbonate amber lens with an LED light source in a convenient cone-mount design. - CCL6S/AA/P/N/LA - flashing, CCL2S/AA/P/N/LA - steady. - Both models feature a light sensing photocell. - Made of high impact polyethelene and designed to fit standard traffic cones. - Powered by a 6 volt lantern battery (not incl.). © Copyright 2013 Dicke Safety Products, Inc. All rights reserved.